Jennifer Cluff: What are some good flute pieces? What are some good flute pieces? Hi there, Jen here. In this post, I am making the mistake of attacking someone's lack of clear language when asking questions on the Internet from 2001 to 2009. This was an era of message boards and list-servs. What had happened is that a younger person had worded their question in such a "careless" way that it would take anyone too long to answer them. As we were answering for free, we wanted to ask them: Please ask your question in a way that will serve the reader better. This instead came out like I was attacking someone's grammar. 1. Do U know of any good flute songs? 2. Does anyone know any good flute pieces? 3. I have a student who's x years old who needs more bouncy & Baroquey? Any ideas? 4. I'm entering a competition or doing an audition and I need an "X" type of flute piece, can anyone suggest titles? 5. I need some free flute music. Help? Here's some help for each. This type of email is not worded well enough, I'm afraid. It's a bit like asking a professional baker if they got any 'wunder-bread'. Firstly, "Songs" are sung by vocalists and have lyrics. Flute pieces are called flute "pieces" or flute "works" or "Flute solos with piano accompaniment" or "Flute Solos that are Unaccompanied". Printed pieces of music on paper are called "sheet-music". "Hey, play this really difficult piece that I'm trying to play right now. It's called The Great Gooshiesmooshie..... and I love it!". An answer like that is probably just another student, not someone who actually knows all the best pieces or the most appropriate pieces for each individual flute student. Hello, I'm hoping to get some help in choosing some new flute pieces. I've just completed Telemann's Sonata in F in my flute lessons, and I enjoy this happy Baroque style. Could anyone recommend a piece similar to the Telemann at just a slighly more difficult level? Could you suggest a piece that's fun, uptempo, and would suit my flute students who are in their third year of private lessons? Is there a book that contains an assortment of these kinds of pieces that would give me several in one book? we're all on a budget. The next thing to do would be to double-check also with your private flute teacher for their recommendations. No two flute students are alike. Your own flute teacher is your best asset in choosing new music. You'll be sifting through about 5 to 50 miscellaneous answers and you'll still be wondering what half the email-senders were talking about. It's far better to consult some basic flute repertoire lists, and even better, look for GRADED repertoire lists so you can figure out what level of difficulty you should be tackling. Firstly, find out approximately what grade or level your flute playing currently is, in order to narrow down the huge number of appropriate flute pieces that might suit you. You can ask your flute teacher what level of playing you're at, and you can consult a flute chart of levels. Secondly, once you know your approximate skill level, then cross-reference it with the various online graded repertoire lists. They may be grade 1 to grade 10 or they may be A to J. They might be I to III or A to D. Figure out the grading system and then choose titles at your current level or just slightly higher. And, hey, there's no point playing the most difficult pieces in the world if you don't have the tone, the tonguing or the fingers. So here are some basic repertoire lists for flute. There are some straightforward flute repertoire lists online, including those from the United Kingdom that have some great graded selections to choose from. If you require "flute with band" or "Flute concertos" use the search button on my site. Also, there is a $7 booklet that lists very high quality "Selected Flute Repertoire" that has been compiled by a fine group of flute experts. Each entry is cross-referenced with a list of flute skills appropriate to that level of piece. Also, here, if you scroll down on arrival, is a Flute World "send me a catalogue" button that you can click on to have a full, detailed, graded flute cataloque to be sent to your door that grades every piece of flute music from 1-5 in difficulty. Here is an online Alry catalogue of contemporary and folk-based flute pieces that aregraded from I to IV (1-to-4) in difficulty. And here is the Fluteworld catalogue online with a composer search button. Each Fluteworld piece is graded from 1-4 and they use 5 to identify pieces using "extended technique". 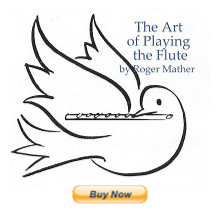 Here is an "Editor's Choice" feature from the great U.K. store called Just Flutes where quite a bit of really good sheetmusic is reviewed by a knowledgable flute expert. You can search by pop music with playalong CD or music for four flutes, whatever suits your fancy. If you are in University and studying flute performance, Leonard Garrison's graded flute repertoire list uses the same A to J grading system that the NFA booklet of selected flute repertoire does. If you're in highschool or first year University, you may want to see My Fave Repertoire, where the most popular pieces for that age group are listed and graded. Flute Magazines such as Flute Talk or Pan Magazine also publish lists of newly published flute music and give reviews of each title. Keen flute players might wish to subscribe to one or both of these publications. They have terrific articles as well as flute CD and sheet music reviews!! Go ahead and bookmark all of these sites, and read about various pieces of flute music on concert reviews and "new publications for flute" reviews online. Google the flute work's titles and add the words program notes to find online descriptions and reviews of the various works. You will become knowledgable, and you might even get very excited about how MUCH good music there is out there. But once again, ask your private teacher about which pieces are best for you right now. Above all other methods, your teacher will be your best resource to finding appropriate skill level pieces for you to play next. 3. I have a student x-years-of-age who needs more bouncy baroquey? Any ideas for whole books? Forty Little Pieces for Beginners is a standard grade 2 flute book. Edited by Louis Moyse, published by Schirmer. I use it with almost every new Beginner just to cover all the bases. Almost every single piece bouncy and Baroque or smooth and classical, but EASY enough for small children. They are short, they are recognizeable, and they are appealing. Totally worth having as a basic all around book for grade 1+ to 2 to 3. I don't necessarily ADORE every single piece, but each one teaches well while being fun and basic. There's also quick and easy guide to inexpensive or "good-buy" flute books for each grade level and a "Favourite Repertoire list" for older students on my website. But by far the best book I can imagine for the student you describe (bouncy baroque) is this one by Schirmer. It has a playalong CD plus full piano parts in the book, and a separate flute insert. So many the pieces are bouncy Baroque-esque. When the booklet arrives by mail, scan levels C and D which correspond to grade 3 and 4 for Canadian exams. The NFA also has another little booklet of etudes as well. Having these two guides is really useful!!! 4. I'm entering a competition or doing an audition and I need X-style or type (Baroque, strings and flute only, Romantic, full orchestra Concerto, is a 5 minute showpiece...etc.etc.) of flute piece, can anyone suggest appropriate flute pieces for this? This question is asked well, as long as the qualifying descriptions are made very clear. This is the kind of question that usually gets intelligent answers from knowledgable flute-repertoire experts. If you ask this way on FLUTElist, Flutenet or Galway-Flute-Chat you will sometimes get very helpful advice, so go ahead and practise being precise in your descriptions. - have the most audience appeal etc. Once again, wording this email politely and informatively (write about yourself as in no. 1 above) will likely get you better assistance from the flute teachers and players who are speed-reading your email. So do please spell out actual words (Please use whole sentences and real english! :>) and give plenty of details about your flute playing and your musical interests when you email a big group of flutists. Otherwise educated flutistic specialists who would normally have tried to help you may instead suspect that you likely need private lessons more than you need "free music" or "music notes" for your fave pop songs. Plus the more details you give, the more likely you'll meet another student flutist with similar likes and dislikes in flute music. - There is very little free and good music on the internet. Most high quality sheet music for flute has to be purchased from a music store, sheet music outlet, or publisher. Free pieces are usually simplified, short, incomplete or pirated. If there was a treasure trove of honest-to-goodness great free sheetmusic on the net, all the flute players would already know about it. See my own list of findings here. - Some students are disappointed when they go to a local store to find "Pop" music books, such as Disney movie flute books or popular song collections written out for flute. Many of these Disney and Pop books are actually very poorly written for flute, and are simply mass-marketed without any thought to how to play the notation that's printed. You may be dismayed by overly difficult rhythms, strange key-signatures (that don't work when yo play along with your "Lion King" DVD), and strange approximations of tunes that don't quite work. If you want popular music for flute, read about these books in advance, or look for the "editor's choice" flute sheetmusic reviews about the best ones. Better yet, consult your flute teacher about which books of music are high quality from the "pop" genre. - If you want to play the flute well, the fastest method is to take lessons with a qualified flute teacher who will assist you in all the special skills of flute playing as well as finding appropriate sheetmusic that you enjoy. One of the side-benefits to lessons is the likelihood that your new flute teacher will be a font of knowledge about great flute sheetmusic and can show you the published pieces so you can preview them during your lessons. They will also be able to suit your tastes and likes and dislikes after they get to know you better, while keeping the level of skill appropriate. If your current flute teacher does not seem to find much music for you to play there may be a reason. "My flute teacher doesn't give me much music to play and I need orchestral excerpts for a youth orchestra audition. Which ones should I get?" c) needs to learn the current level of pieces their flute teacher has already asked them to learn before ambitiously seeking "new pieces" that the teacher doesn't know about. Sometimes a combination of all the above things may help a student match themselves with a teacher who clearly understands the student's needs. Ah, good. I hope that this is read many times over. The proper question-writing goes not only for the online world of flute, but the online world of everything else. People's language skills have definitely deteriorated. Hilarious! GooshieSmooshie is one fantastic piece of flute music. I read somewhere that it originated as a free-form improv by a 94 yr. old flutist who fell in love very very late in life. Great flute piece! Lots of freely improvised cadenzas....hahhahaha. Oh boy, those 94-year-old lovers...you never can tell, can you? :-P Hahahahaaaa!!! It's 2014 now; the above article was written four years ago. 2nd and 3rd year students? And that was all the email said. while all the rest go into a swoon when they play it.). students change as they age, and progress too. three years of flute study. several solo works, and let them choose. But again there are many differences between students. year are still playing grade 2.
will know what other teacher's choose over their long careers. Obviously certain works are both pedagogically sound and popular. Class teaching or individual teaching? Progressing at same rate, or individual rates of progression? Does 1st to 3rd years equate to grades 1 to 3 in flute exams? Pieces: In books of "collections for flute" or purchased individually? Suitable for children? Or for adult beginners as well? already using to choose pieces? Is the teacher new to teaching or experienced? General: What's the situation exactly? If you clarify, more people may be able to answer. This is an update with newer links, so I copied it here in the comments. I think trying to understand the question as it is, is much kinder than ripping apart their spelling and grammar and such. When someone is asking for help or advice, I would never expect that they would looked down upon for doing so. This is just my opinion, no need to take it to heart. Of course you're right; ripping apart somebody's grammar isn't fun and doesn't help. But way back when this was written, there were still message boards where kids and teens left questions, and they were wondering why nobody was taking the time to answer them. Several of us who answered questions for free became frustrated by how little effort the kids were putting into asking the questions. Of course, it never crossed our minds that lots of kids don't even speak English as a first language; we just assumed they were being lazy. Well, I know a lot more now about the internet than I did in 2001 when I first started answering questions for free. So I've made my mistakes; you are correct.